If your heart is beating you are ready to be...rhythmologised ! Looking for a corporate team building drumming conference energiser, meeting ice breaker, away day activity or need to put a fun indoor team building exercise in place? Improve attitudes with our totally interactive corporate entertainment! An Active Rhythmology contribution to your corporate team building session encourages effective co-operation rather than competition amongst your staff. You know it is always good to drum up new business and some of the benefits of our work include a happier more productive workforce, better rapport between staff across all levels and more creativity. Hand drumming is easy to do, so while people are having fun they don't realise they are using drums to talk to others that they would normally ignore. Breaking down barriers in this way can be seen to have the best effect across staff levels - when the caretaker, director and everyone else in-between find they can get along, be ready for some improvements in the corporate work culture. Instead of African drumming, Samba Band or other single culture activity where parts have to be learned, imagine how our rhythm events allow all to easily take part and feel included, regardless of their natural musical ability. What's the best group rhythm activity for your team building event? Our coporate team building drumming activities or fun celebrations benefit everyone - even the most reluctant (who probably needed it most!). We do not try to transform each individual into a virtuoso drummer, although we do aim to have everyone co-operating to achieve the best overall sound for the group. Try to resist taking part and you will realise why our drum workshops are such an effective corporate team building drumming activity. Watch a video of a corporate team building drumming workshop provided by Active Rhythmology - then visit the Contact page to get in touch so we can discuss the best activity options for your corporate team building event. 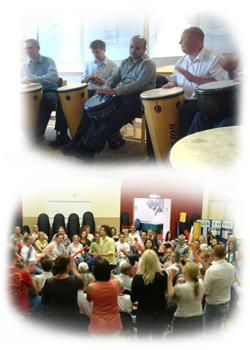 Active Rhythmology team building drumming sessions are suitable for group sizes from a handful to several hundred. We advise on how we can best help you make a success of your corporate conference, business meeting, team building activity, indoor away day or other event. 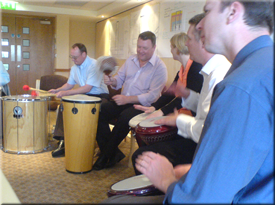 Team building drumming and group rhythm making programs are tailored to suit your needs e.g. Ice breaker - drumming, percussion or Boomwhackers by all to build rapport at the start of a business event. Icebreakers make meetings or indoor team building sessions fun for all delegates. Celebration finale - high-energy, up-beat finale for a corporate conference closing activity. Energiser - drumming, percussion or Boomwhackers to generate energy and focus attention - ideal to start a conference or revive delegates in the after lunch 'graveyard' slot. Guerrilla rhythms - short bursts of fun percussion activities by delegates during a seminar to maintain energy. Drumming Workshops - break out activities with smaller groups to prepare for a whole conference rhythm event later, or as fun team working sessions in their own right. Junk percussion sessions - to compliment recycling and environment awareness initiatives - or simply to have fun and get stress relief by beating something! Drum Circle - creative indoor team building activity where the music expressed is dependent on the quality of relationships developed during the event rather than expertise. The collaborative musical activity can access deeper levels and enhance the message of a training program. Regular Drumming Workshops or Circles - frequent stimulation to keep minds active, maintain relationships and boost moral.